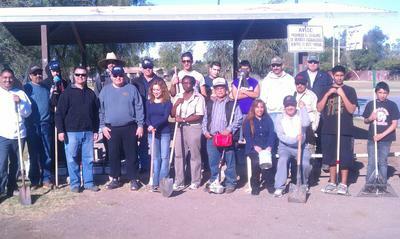 The neighborhood involvement and participation for the past several years has been outstanding. 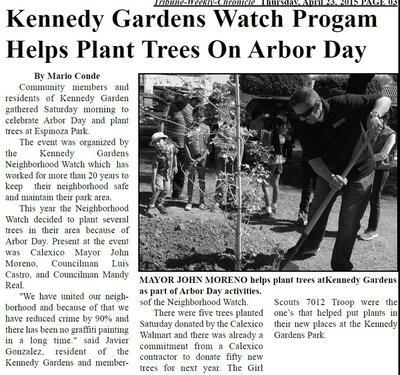 Editors Reply: Wow, Javier, thanks for sending us the photos and the news article about your Arbor Day tree planting event. This is a simple idea that almost any community could imitate, putting their own twist on your nice event. Trees really can have a strong beautification impact for not much money. Readers, note that Javier and his group were able to get their local Wal Mart to donate the trees themselves, so their expenses probably were very minimal. Also you can see from the news article that they were able to use Girl Scouts as part of the labor pool. 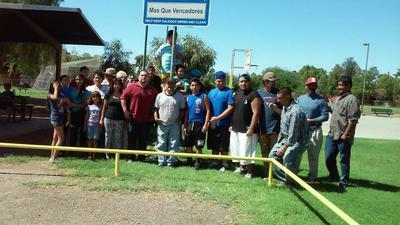 Again, this could happen all over the U.S., and other countries have equivalent youth development organizations. It is important for children and youth to develop some connection with nature, if only through understanding how to plant a tree--how deep do you plant it, how wide is the hole you need to dig, and so forth. Another interesting aspect of the article is that the neighborhood watch unit appears to be the major sponsor. Sometimes the neighborhood watch activities become too negative and suspicious of others, but this type of activity actually builds trust and helps people get to know one another. 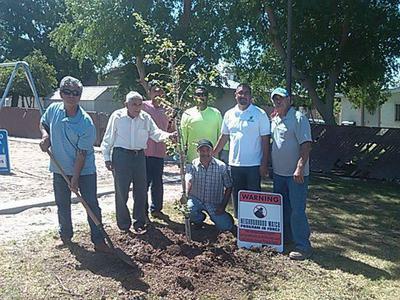 If there is no viable neighborhood association, those who are active in a neighborhood watch constitute a logical and helpful group that could create your Arbor Day tree planting. If you are not familiar with Arbor Day, it is a special day on the last Friday in April. In the state of Nebraska, Arbor Day is a big deal, but others of you can revive the idea. It is an ideal time of year to get neighbors outside and have some good times together while doing a little community beautification. This type of community improvement project would be especially helpful where there is cultural, racial, or ethnic diversity, or some type of geographic divide that you are trying to bridge. Cooperating on a simple project is one way to build community in the best sense. An additional part of your day could be some sort of quite simple refreshment, even if only cookies or lemonade. Giving people an excuse to spend a little more time with one another helps to build the relationships that may lead to additional types of community projects and just plain interest in the community and civic engagement. Generally, you might want to adapt some of the ideas from our cleaning up your neighborhood park page. Thanks for pointing out this great project, Javier, which teaches us that a community beautification project does not need to be expensive or elaborate.